Successfully Added Waterproof CREE LED Flashlight with Long Throw Reflector to your Shopping Cart. The G260 was specifically designed to achieve the longest light throw distance of any flashlight in its class. Similar sized flashlights can not compete. That’s because the G260 uses a revolutionary “Super Reflector” which exceeds the light gathering limits of previous EDC (Every Day Carry) LED flashlights. The result is 20% more light gathering capability while maintaining a 36mm diameter reflector size-- making this powerful flashlight easy to carry and store no matter where you go. The “Super reflector” also features a heat sink which keeps the light 30% cooler than similar LED flashlights. This allows for continuous high output use without overheating or degrading the performance of the LED. The back of this device features a click button which allows you to select from 5 different light settings. There’s a low, medium, and high output setting- as well as a fast and slow “flash” setting for signaling to others in case of an emergency. You can use the G260 CREE LED flashlight for up to 110 minutes on the maximum setting or switch the light setting to “low” and you can use this LED flashlight for up to an amazing 24 hours! 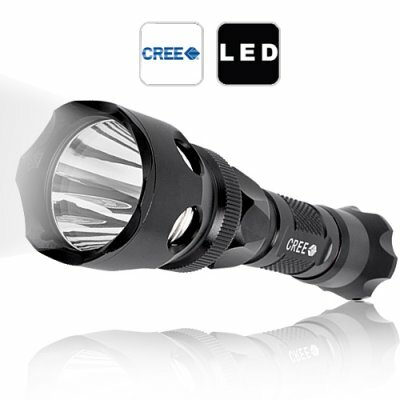 The best part is that the CREE LED itself was designed to last up to an incredible 50,000 hours of use. That’s over 5 years of nonstop use! A more practical example would be an entire lifetime worth of casual everyday use. Important Note: Looking directly into the LED will cause permanent eye damage. Do NOT leave this product where children can get a hold of it. Chinavasion is not responsible for any personal injury caused by misuse of this high powered CREE LED torchlight.